The purpose of this study was to investigate the need for and choice of stratification factors, and the effects of blinding and placebo in a clinical experiment. 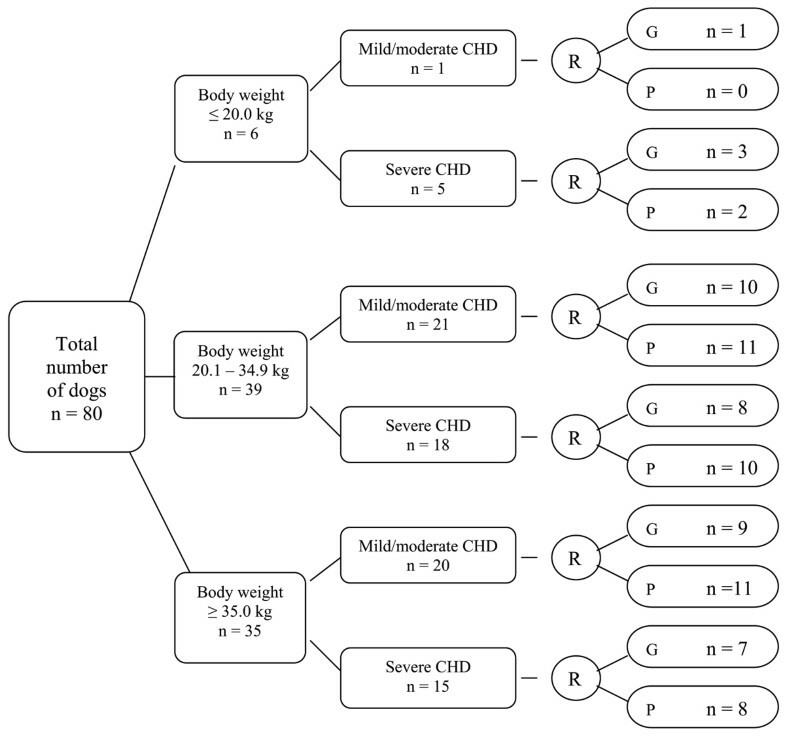 Eighty dogs with canine hip dysplasia (CHD) were included in a randomized, placebo-controlled and double blind clinical trial with stratified parallel group design, in which body weight and degree of CHD were used as stratification factors. Thirty-eight dogs were allocated to gold bead implantation and 42 to placebo. After six months, 33 of the 42 placebo-treated dogs received gold bead implantation in an open study lasting a further 18 months. The main outcome variable in the study was change in pain signs of CHD as assessed by the owner. No significant difference in the main outcome variable, regardless of the treatment given, could be detected in the two chosen stratification factors. The only factor to influence the main outcome variable significantly was age. The blinding procedure used in the study, in which 60% of the owners correctly guessed the treatment given, was found sufficient. Of those who guessed the treatment erroneously, 88% believed the treatment given was gold bead implantation. The treatment efficacy after six months in the blinded treatment group was found to be significantly larger compared to the efficacy obtained in the open study. A significant placebo effect was therefore detected. Conclusion and Clinical Relevance: The age of the dogs influenced the outcome of the CHD treatment, and is recommended as a stratification factor. A significant placebo effect has to be expected and an optimal blinding procedure is necessary in similar clinical studies. Stratifisering, blinding og placeboeffekt i en randomisert, dobbeltblind og placebokontrollert klinisk undersøkelse av gullimplantasjon hos hunder med hofteleddsdysplasi. Hensikten med studien var å undersøke behovet for og valget av stratifiseringsfaktorer, og effekten av blinding og placebobehandling. Åtti hunder med hofteleddsdysplasi (HD) ble inkludert i en randomisert, placebokontrollert og dobbeltblind klinisk undersøkelse med stratifisert parallellgruppedesign. Kroppsvekt og graden av HD ble valgt som stratifi-seringsfaktorer. Trettiåtte hunder ble trukket til en engangs gullimplantasjonsbehandling og 42 hunder ble trukket til placebobehandling. Etter seks måneder (blindstudien) fikk 33 av de 42 placebobehandlede hundene gullimplantasjon i en åpen undersøkelse som varte i ytterliggere 18 måneder. Behandlingseffekten var den viktigste effektparameteren. Den ble vurdert av eieren som endring i smertesymptomer fra hofteleddsdysplasien. Ingen signifikant forskjell i behandlingseffekt uavhengig av behandling ble funnet med de to valgte stratifiseringsfaktorene. Alder var den eneste faktoren som signifikant influerte på behandlingseffekten. Seksti prosent av hundeeierne gjettet korrekt på hvilken type behandling de trodde hunden deres hadde fått. Blindingsprosedyren ble derfor ansett som tilstrekkelig. Blant eierne som gjettet feil trodde 88% at hundene hadde fått gull implantert. Behandlingseffekten i blindstudien var signifikant bedre enn effekten i den åpne studien. En signifikant placeboeffekt ble funnet. Konklusjon og klinisk relevans: Alderen til hundene påvirket utfallet av behandlingen, og er derfor anbefalt som stratifiseringsfaktor. En signifikant placeboeffekt må forventes, og en optimal blindingsprosedyre er derfor nødvendig. Different treatments for canine hip dysplasia (CHD) have been described, with variable success. suggested that the implantation of gold beads at specific acupuncture points in dogs with chronic pain due to hip dysplasia seemed promising. During the planning of a clinical therapy trial with implantation of gold beads in CHD, no information on the most suitable stratification factors could be found in the published literature. While CHD is a very common disorder in dogs and a large number of publications exists on its etiology, risk factors for development, breed prevalence, diagnostic methods, importance of prognostic factors for the development of coxarthrosis, and different therapeutic methods, good methodological studies of factors influencing treatment outcome are lacking. During statistical analysis of treatment results, it is highly desirable to have as equal groups as possible regarding both the patient characteristics and diagnosis of disease. Although methods of statistical analysis exist to compensate for unequal treatment groups, it is more convincing to present data from equivalent groups, and stratification is a method for equalizing treatment groups [19, 25]. If we know the factors that may influence the outcome of a specific treatment, we may need to stratify for those factors. Sometimes the same factor that causes a disease may influence the outcome of treatment. However, the etiological factors are often different from the stratification factors that affect the results of treatment. In CHD, heredity is an important etiologic factor, but is not necessarily a factor that affects the outcome of a hip dysplasia treatment. When comparing small treatment groups of up to 50 dogs, it is important to eliminate or balance the factors that influence the outcome [23, 19]. How can stratification factors be identified? In smaller studies, this can be done by surmising all factors that could possibly influence the outcome of the treatment. The number of such factors may be large and the choice may be difficult. To stratify the animals on too many factors will result in many groups with few cases each. Consideration of earlier published trials or related experiments may also indicate one or more factors that may affect treatment outcome. Former treatment trials of CHD with published stratification factors were not found, although a related study of risk factors for degenerative joint disease associated with hip dysplasia found that body weight and hip joint laxity were such risk factors . It may be of psychological benefit if the person reporting the treatment effect knows that the animal is receiving a new treatment. In contrast, owners that know their animal is on a standard treatment may react unfavorably if they are made aware that other patients are "privileged" by receiving a new therapy. Such attitudes towards the given therapy may affect the owner's co-operation in a study, and may also influence the reported efficacy of the given treatment and any comparison of treatments in a controlled clinical trial (CCT) in animals, or may be distorted if the patient or animal owner, or those responsible for treatment and evaluation, know which treatment is being used. This problem can be avoided by performing a double blind trial, in which neither patient or owner nor physician or veterinarian are aware of which treatment the patient or animal is receiving. The first study to include blinding in CCT seems to have been published in 1927, and concerned vaccines for the common cold . In the first reported experiments with control groups [9, 17], the allocation to treatment was arbitrary or simply decided by the investigator. Any blinded and balanced CCT should include an investigation of a possible placebo effect. A placebo effect is any medical intervention that has a favorable, non-specific, psychological, or psycho-physiological therapeutic effect, but without specific activity for the condition being treated. This non-specific effect may also be negative, that is, unfavorable , in which case it is called a nocebo effect. To the best of the authors' knowledge,  performed the first placebo CCT in 1799 and described the placebo effect for the first time. Placebo effects are commonly reported in CCT studies where humans are involved. In addition to Pavlov's morphine experiments on dogs , one of the first to describe this effect in animals was , who injected scopolamine hydrobromide to laboratory rats and demonstrated that saline injections to some extent imitated the effect of the drug. Other studies of conditioning placebo responses have been performed in animals [20, 26]. However, the prime reason for introducing placebo controls is to distinguish between the effect caused by an active treatment, and other effects due to reasons not related to the active treatment. A possible placebo effect was discussed in a study of gold wire implants in CHD where an equal improvement in locomotion and pain as evaluated by owners was found in both the placebo and treatment groups . A placebo effect in companion animals that resembles those reported in human CCTs, where treatment efficacy is assessed by the dog owner several months after the treatment had been given to the dog, seems not to have been shown in veterinary clinical studies. The aim of this methodology study was to examine the need for and choice of stratification factors in the treatment of canine hip dysplasia, and to investigate the effect of blinding and placebo in a controlled clinical trial of pain treatment in CHD. A total of 80 dogs recruited from all parts of Norway, with pain and difficulty of movement due to canine hip dysplasia (CHD), were included in the study. The diagnosis of CHD was based on radiographs and was graded as mild, moderate or severe according to the guidelines given by the Scientific Commission of the Nordic Kennel Union and Federation Cyno-logique Internationale. Dogs between one and eight years of age, of both genders and all breeds including mixed breeds, could participate. The reference population for the study consisted of all family dogs in Norway. The dogs were recruited through advertisement in veterinary and breeder clubs' magazines. This resulted in 47 females and 33 males whereof six and one were neutered, respectively. Twenty-eight breeds were represented. Dogs with other diseases related to the nervous, muscular or skeletal systems were excluded. Exclusion was based on a thorough examination described below under clinical procedure. Dogs with previous acupuncture experience were also excluded from the study. The study was carried out as a randomised placebo-controlled and observer-blind clinical trial with stratified parallel group design (Fig. 1). The main outcome parameter was change in pain signs of CHD as assessed by the owner. The stratification factors used were body weight in three groups and degree of CHD diagnosed by radiography divided into two groups (mild/moderate CHD and severe CHD). The design resulted in six strata. Within each strata the patients were randomized to receive either gold bead implantation or placebo once in ratio 1:1 by using block randomization with a fixed blocksize of four. An error occurred during classification of cases, which resulted in an unbalanced group in the stratum mild/moderate hip dysplasia with body weight ≥35.0 kg, where 20 dogs were distributed 11: 9 in the placebo group and the gold implantation group, respectively. With a number of 20 dogs, ten dogs should have been equally distributed in each treatment group with a blocksize of four. A total of 38 dogs were treated blindly with gold bead implantation and 42 with placebo (Table 1). The treatment was blinded for both the owners and the responsible researcher during the first six months of the trial period, after which the randomisation code was broken and the placebo-treated dogs were offered gold bead implantation. Of the 42 dogs in the placebo group, 33 subsequently received gold bead implantation. The follow-up period was carried out as an open study with a duration of further 18 months, and included both the dogs from the blinded six month study and the open study group. The total follow up period was therefore 24 months from the start of the study. 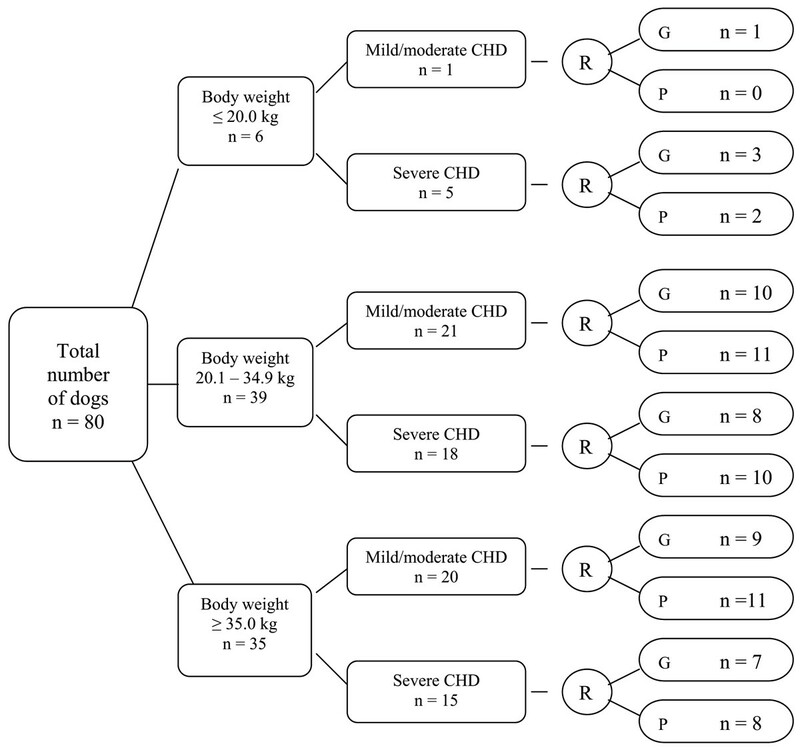 Flow chart of the study design of 80 dogs with different degrees of canine hip dysplasia (CHD) included in a double blind randomized clinical trial. The numbers (n) indicate the number of dogs within each strata and randomized groups. (G) = Gold implantation group. (P) = Placebo group. (R) = Randomization procedure. Number of dogs participating in a clinical controlled therapy trial of 80 dogs with different degrees of canine hip dysplasia. The dogs were randomly assigned to receive either gold bead implantation or placebo in a blinded 6-month study. The dogs in the placebo group were thereafter offered a crossover to gold bead implantation, and all dogs were followed in an open trial for another 18 months. In the blinded six-month period, two dogs from the active group dropped out due to administrative reasons (Table 1). In the 18 month follow up period two of 36 dogs originally treated with gold implantation dropped out due to administrative reasons and two discontinued for reasons related to the treatment. Of the 33 dogs in the placebo group that were given gold bead implantation at the start of the 18 month follow up period, one dropped out for reasons not related to the treatment, and three withdrew, two of them for unknown reasons. The treatment results of the clinical trial have been reported elsewhere . At the enrolment consultation, the owner was asked about the dog's clinical signs and medical history using a standardized questionnaire. Thereafter, all the dogs were thoroughly examined with special attention to the gait and movement, the lumbar spine and muscles and the skeleton of the hind limbs. The examination included a neurological examination and hip extension test. All dogs were sedated and anesthetized, and then the coat was clipped over one or both hips. A veterinarian certified in veterinary acupuncture marked the acupuncture points with one colour and marked another five non-acupuncture points with a different colour. The same veterinarian performed the clinical examinations both initially and at every control visit throughout the whole follow up period. Hip radiographs were performed to confirm the diagnosis of CHD. Depending on their body weight and radiographic hip score, the dogs were assigned to one of six different strata. Within each strata, dogs were randomly assigned a gold bead implantation or placebo in accordance with a sealed pre-randomization list. Another veterinarian specially trained in the technique performed the gold bead implantation through the acupuncture points, while dogs allocated the placebo had the skin at the non-acupuncture points penetrated with a needle of the same type and size as the one used for gold bead implantation. The dogs were re-examined 14 days, three months and six months after surgery. At the six month visit the owners were asked what kind of treatment, gold or placebo, they believed had been given to their dog. The main outcome parameter, change in pain signs of CHD as assessed by the owner, was recorded on a six point fixed scale (see Table 2). Participation was free of charge and the owner signed a written consent. The Norwegian Animal Research Authority approved the study. Number of dogs with achieved treatment effect recorded as change in pain signs of canine hip dysplasia (CHD) assessed by the owner, related to the two stratification factors bodyweight and degree of CHD. Distribution of dogs according to the non-design stratum gender is also shown. All the results were expressed in contingency tables . Frequencies were expressed in percentages with 95% confidence intervals (CI) and calculated using the Binomial distribution . Comparisons of groups were performed by categorical data analysis controlled for the actual treatment given . In order to study the contribution of the independent variables, a multiple regression analysis weighted for the treatment given, based on a second-degree polynome, was performed . All hypotheses were tested two-tailed, and differences were considered statistically significant if the p-value was found to be less than or equal to a level of 5%. On request, 63 of the 78 participating owners blindly guessed the treatment given to their dogs (Table 3). The probability of correctly guessing the treatment was estimated to be 38/63 or 60% (CI 47.2–72.4%). The divergence from the expected 50% was not significant (p = 0.10). Owner's guess of treatment given versus actual treatment given and their prospective wishes regarding gold bead implantation for their dog in a clinical controlled therapy trial of 80 dogs with canine hip dysplasia. The two opinions of the owner were requested at the end of the 6 month trial and before the randomization code was broken. One dog owner per dog expressed their opinion. Twenty-two of the 30 owners guessed that gold implantation had been given to their placebo treated dogs, which is 73% (CI 54.1–87.7) (Table 3). A total of 25 owners erroneously guessed the treatment. Of those, 22 or 88% (CI 68.8 – 97.5%) believed the treatment given was gold bead implantation, while three owners or 12% (CI 2.6–31.2%) guessed placebo. When the owner guessed that gold was given they also reported a greater improvement (p < 0.01) in pain signs compared to those who guessed placebo or were uncertain about the treatment given (Table 4). No significant difference in change in pain signs reported by the owner was found between these two last-mentioned groups. Thus, a significant placebo effect (p < 0.01) was detected (Table 3), and was supported by the findings presented in Table 4. Distribution of 78 dogs in a blinded clinical trial of canine hip dysplasia (CHD) with gold bead implantation or placebo treatment according to the main outcome variable, change in pain signs of CHD, versus the owner's guess of treatment given. The opinion of the owner was requested at the end of the blinded trial period (six months), but before the randomization code was broken. All the 11 owners who guessed that placebo was given wanted gold bead implantation in case of correct guessing (Table 3). Similar results were also found in the group of uncertain owners. Of the 52 who believed that gold had been implanted, 35 or 67% wanted gold implantation if their dog belonged to the placebo group. There was a significant difference (p = 0.01) between the gold implantation group and the placebo group with respect to the owner's negative reply regarding further gold treatment if their dog had ended up in the placebo group. On the basis on prior knowledge, both body weight and degree of CHD were chosen as stratification factors in the study design (Table 2). No significant differences in the main outcome parameter, when accounting for the actual treatment given, were detected for CHD (p = 0.25) or body weight (p = 0.44). However, the multiple regression analyses indicated that the interactions between CHD and body weight contributed significantly to explain the improvement in pain signs. Gender was tested as a possible stratification factor. No significant difference was found between the genders (p = 0.59) in the main outcome variable, change of pain signs (Table 2). Age was found to have a significant influence on change in pain signs (Table 5). By dividing the observed age distribution into quartiles, the four age strata were defined as ≤2.6 years, 2.7–4.5 years, 4.6–5.9 years and ≥6.0 years. A negative linear correlation was found between age and change in pain signs (r = -0.14). A stronger relationship was found using a second-degree polynome (Fig. 2), leading to the following suggested three age strata, ≤2.5 years, 2.6–6.0 years and ≥6.1 years (Table 5). If only two age strata are requested, an age = 4.0 years and >4.1 years are suggested, based on the same linear regression analyses. Estimated probability of improvement in pain signs of canine hip dysplasia related to four, three and two age strata. The results are expressed in percent with 95% confidence intervals. (n) = number of dogs. 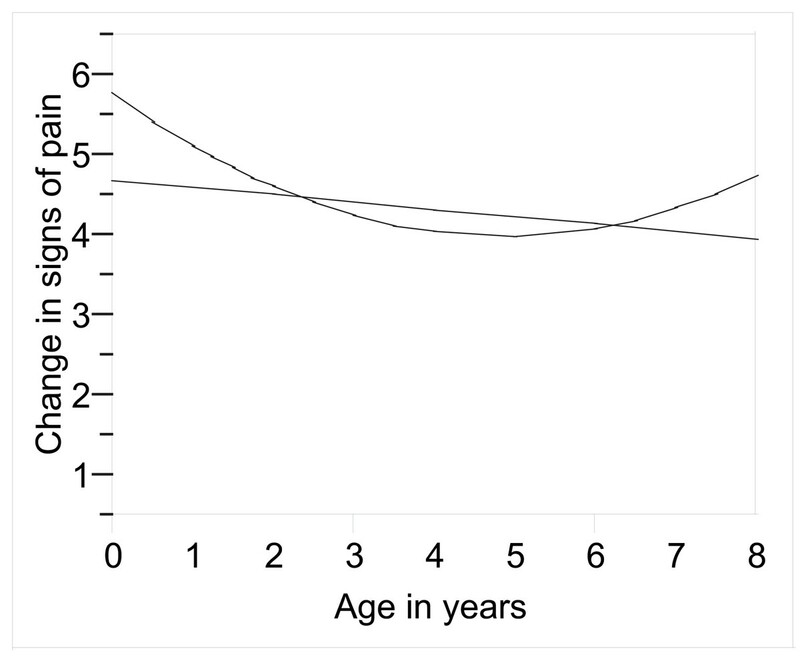 Regression analysis of age and pain signs in 80 dogs with canine hip dysplasia (CHD). The straight line represents the linear relationship between the independent variable, age, and the dependent variable, change in pain signs. The curved line indicates the relationship expressed by the second-degree polynome. Change in signs of pain of CHD assessed by the owner was recorded by a six point fixed scale where 1 = large aggravation, 2 = mild aggravation, 3 = no change in pain signs, 4 = mild improvement, 5 = large improvement and 6 = complete recovery. After six months the randomization code was broken, and the patients who previously received a placebo now received gold bead implantation as an open treatment. All the dogs were followed for a further 18 months, and the efficacy was recorded additionally after six months. The treatment efficacy in pain signs in the blinded study group of gold bead implantation was found to be significantly larger compared to the efficacy obtained in the first six months during the open treatment (p = 0.02) in the previous placebo group that received gold bead implantation (Table 6). Distribution of 68 dogs according to change in pain signs of hip dysplasia (CHD) after gold bead implantation in a controlled clinical trial of CHD. The treatment effect for gold bead implantation is given in the blinded trial versus the open treatment trial. Several factors can affect the development of canine hip dysplasia, and among them is body weight . We also know that joint stability is influenced both by the amount of muscle mass surrounding the joint and the weight the joint must support [4, 28]. In a comparable study in humans , a significant correlation between obesity and bilateral knee osteoarthritis was reported. In that study, however, body weight itself was not found to have any influence on treatment efficacy unless there was obesity and hence enhanced weight load on the joint. As clinicians trained in the causes of a specific disease, we can mistakenly come to regard a cause as a factor that can influence the outcome of a treatment. Although we chose body weight as a stratification factor, this did not actually affect the outcome of the study. Previous investigations have revealed a lack of correlation between changes of the hip, determined radiographically, and the clinical signs of hip dysplasia [30, 27]. However, to the best of our knowledge no information exists on whether severe degrees of hip dysplasia are more difficult to treat than milder degrees. The interactions between CHD and body weight apparently contributed to explain the improvement in pain signs in this study. Dogs with milder degrees of hip dysplasia had a rising tendency of improvement in pain signs with increasing body weight. The opposite occurred with severe hip dysplasia, as the improvement in pain signs decreased with increasing body weight. However, the number of dogs in the analysis was too small to provide a conclusive interpretation. Age and gender are two other possible stratification factors that could have been used in the study design. We found that dogs younger than 2.6 years had the best effect of the treatment. This is not surprising, since spontaneous improvement in limb function may occur as dogs reach maturity [27, 2]. Due to this fact, one of the exclusion criteria was dogs less than one year, even though many dogs do not reach maturity until much later than this age, depending on their final size and developed muscle mass. This result was confirmed with multiple regression analysis, with best improvement in pain signs in dogs less than 2.5 years of age. This analysis also revealed that dogs older than six years had an increased improvement in pain signs. One possible explanation for this can be that dogs in this study all were carefully selected and excluded if other diseases were present. Additionally, there may be a difference in the pathobiology between the dogs in the youngest and oldest age groups when entering the study. Age is therefore a variable that may enhance the apparent treatment effect, and is consequently recommended as a stratification factor. The placebo effect is well documented in animal trials [12, 3, 24], and explained by Pavlovian conditioning. Studies of the placebo effect have, however, been limited primarily to laboratory animals in laboratory environments, and animals living in a family home under normal family conditions have been poorly documented. The current study indicated a significant placebo effect, since significantly more owners guessed erroneously that gold bead was given than placebo, and since those who guessed that gold bead was given reported more improvement in pain signs than those who guessed that placebo was given. We assumed that owners, by taking the decision to participate in a trial, would have a positive attitude towards a new and possibly controversial treatment using gold bead implantation and acupuncture, and this attitude was a potential source of bias. One of the exclusion criteria was therefore dogs with previous acupuncture experience. Another contribution to the placebo effect is a patient's expectation of the treatment [22, 8]. The owners' expectations of the treatment effect can induce a placebo effect in both treatment groups. It may also reflect what treatment they believe has been given to their dogs, since the owners' opinions were included in the evaluation of the effect. This was confirmed when owners answered the question of whether further gold treatment was desired or not. Another possible explanation of the improvement in the placebo group is that dogs may discern both their owner's signals  and also attitude towards the treatment, the clinic and the veterinarian, and thereby give their owners an impression of improvement or aggravation. Dogs may behave differently due to the owners' new signals and may also be encouraged to engage in forms of exercise that they previously were spared for, but nonetheless, after a while were able to do without any signs of pain. When comparing the open versus blind studies, the best effect was achieved in the blind study, which is in accordance with other studies [3, 7]. In the blind study the placebo effect was included, and in the open study probably the nocebo effect was included. The true effect of the gold bead treatment probably lay somewhere between these two results. Age seems to be the proper choice of stratification factor in therapy studies of canine hip dysplasia with a limited number (50–200) of participating dogs. A significant placebo effect must be expected, and blinding and randomization are necessary in studies where the outcome of the treatment is based upon the owners' perception of improvement of the clinical signs. Reprints may be obtained from: Gry T. Jæger, Department of Companion Animal Clinical Sciences, Norwegian School of Veterinary Science, P. O. Box 8146 Dep., N-0033 Oslo, Norway. The project was supported in part by grant no NFR 123873/320 and NFR 141822/320 by The Research Council of Norway, Dyreidentitet AS and The Norwegian School of Veterinary Science. The authors thank Mrs Bernadette Helmer and Lena Stenhaug for technical assistance, Dr. David Griffiths for valuable comments on the English language, and also the Norwegian Kennel Club for supporting co-operation.